Jacob S. Ramer, a minister of the Brick Meeting House, Snyder County, Pennsylvania, and of the Duchess Mennonite Church at Duchess, Alberta, was born 17 August 1846 and died 6 August 1925 at Duchess Alberta. He was married to Elizabeth S. Brubaker. They had four sons. 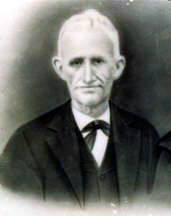 Jacob S. Ramer was ordained to the ministry at the Brick Meeting House in Snyder County, Pennsylvania, on 1 August 1895. It was, however, later reported that he was a respected man but preached very little. He served with other ministers until he moved from the district. He frequently gave his testimony in German. Jacob Ramer was a widower when he came west to the Duchess area of Alberta in 1915, together with his son and daughter in law, Samuel B. and Martha (Hettie) Ramer. They were some of the first settlers in the Duchess area, and instrumental in organizing a new Mennonite church there in 1917. In Jacob Ramer's obituary it was reported that he acted in his capacity as minister "as health permitted." His son, Henry Brubaker Ramer, who left Pennsylvania for the Duchess area of Alberta in 1917, was ordained as a minister in the Duchess church in 1919. Clarence J. Ramer, a grandson, and the son of Henry Brubaker Ramer, served the Duchess Mennonite church for many years as minister and bishop. "Duchess Mennonite Church History." 25 May 1997. Unpublished manuscript made available by Mary Burkholder of Duchess. Regehr, Ted D. "Ramer, Jacob S. (1846-1925)." Global Anabaptist Mennonite Encyclopedia Online. December 2003. Web. 18 Apr 2019. http://gameo.org/index.php?title=Ramer,_Jacob_S._(1846-1925)&oldid=93341. Regehr, Ted D. (December 2003). Ramer, Jacob S. (1846-1925). Global Anabaptist Mennonite Encyclopedia Online. Retrieved 18 April 2019, from http://gameo.org/index.php?title=Ramer,_Jacob_S._(1846-1925)&oldid=93341.